Custom shape notepads and sticky notes inspire you to think outside the box and rise above the competition with ease. No doubt, square notepads are iconic and classic but why not stretch your outreach a step ahead with these colorful and pre-designed shapes and sizes. If you are searching for a purposeful promotional gift, this comprehensive selection of adhesive pads and non-adhesive pads will impress you. You can get your business information imprinted on each page of these sticky notes prior to distribution. You can save on online design proof and artwork assistance as their prices are included! Avail benefits of fast shipping anywhere within the contiguous USA. Custom shaped pads are popular as they offer best visibility against all odds. Advertises who cannot afford to spend on promotional gifts can always rely on these unique shaped pads to generate strong brand impressions and strike rapport with their customers. Custom shaped notepads are offered in a variety of shapes such as computer, truck, telephone, tooth, apple, shopping cart, arrow and many more. Marketers who are trying hard to find their footage in the market can easily rely on these shaped notepads for making the right impressions. Be it schools events, corporate events, family reunions, individual celebrations or any other mass attended or moderately represented events, you can always make a beeline by handing out these notepads. People will be happy to scribble their emotions, impressions, errands, office information, and various other things over these notepads. 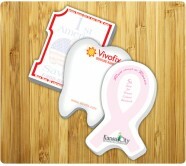 At NotepadsDirect.com, you can select custom shaped promotional sticky and non-sticky notes at extremely affordable prices. This growing selection features Post-It notes and non-adhesive notepads in over 30+ shapes. These promotional sticky notes are available in 25, 50 or 100 sheet pads and they are offered with your FREE four-color process imprint. Some of the best selling promotional notepads in our collection include light bulb sticky notes, stop sign sticky notes, star shape sticky pads, dollar sign sticky note pads and #1 shaped sticky notes. People are going to retain these customized shape notepads and sticky notes due to their attractive shape. It means your brand logo is going to remain dear to them for a long time. Buy these best seller custom shaped notepads today or give us a call at 855-866-8372! 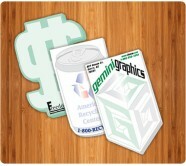 You can get these notepads printed with your business information at very small price from Notepadsdirect.com. To know more about it, feel free to write to us at info@Notepadsdirect.com.